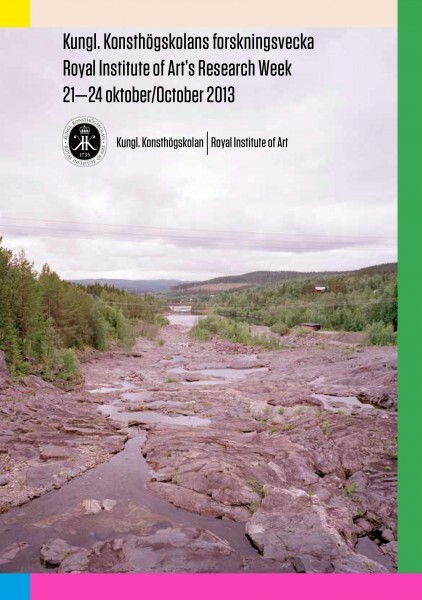 Welcome to the Royal Institute of Art’s Research Week 2013 – 21-24 October! The Research Week programme includes presentations by students, teachers and invited guests, who share aspects of artistic research and development projects and related practices. The programme also includes two longer discussion blocks on the themes: ”What does it mean to publish as an artist?” and: ”Artistic processes in the archive”. The presentations are held in Galleri Mejan, Exercisplan 3, Skeppsholmen, Skeppsholmsstudion, Slupskjulsvägen 34, Hus 28 (behind KKH:s main building on Skeppsholmen) and a film screening at the cinema Zita (book via https://bokazita.com/chap/ajax/tomovie@salongnr=1&tid=18:00&datum=2013-10-24). All the presentations are free and open to the public. The physical works are on display until 27 October in Galleri Mejan. “Italian design achieved major international acclaim when an ex- pansive exhibition on the works of Italian contemporary designers and architects was assembled for New York’s Museum of Modern Art in May of 1972. Curated by the young Argentinian born Prince- ton educated Emilio Ambasz, Italy: the New Domestic landscape,1 showcased some of the most provocative design objects and en- vironmental prototypes to emerge from Europe in these years. Am- basz’s gaze on Italy was part of a calculated strategy to introduce to an American audience a more politically charged, and critically complex approach to what had up until then been a largely rationally driven industrial process yielding product designs. The Italian design phenomenon grew out of a particularly turbulent moment in Italian contemporary history. The nation’s surging reconstruction, spectacular rise in wealth and along with it the drag of an expanding underprivileged population strained the limits of the social fabric. From the mid-sixties well into the early eighties, the country experienced enormous social unrest, student and worker occupations and armed militant ac- tions that lasted far longer than in any of the other European nations, Germany included. An entire generation, however, was moved to radical extremes, not just architects and designers. THIS VIrTUAl lEcTUrE IS ScrEENED lIVE. Peter lang är professor i arkitekturhistoria och arkitekturteori vid Kungl. Konsthögskolan. Han är en av curatorerna för utställningen: “Environ­ ments and counter Environments. ”Italy: The New Domestic landscape”, MoMA, 1972”, Graham Foundation, New york, 18/9­14/12 2013. Peter Lang is Professor in Architecture History and Theory at the Royal Institute of Art. He is one of the curators for the show: “Environments and Counter Environments. ”Italy: The New Domestic Landscape”, MoMA, 1972”, Graham Foundation, New York, 18/9-14/12 2013. ”Den italienska formgivningen fick stort internationellt genom­ slag i samband med en omfattande utställning med arbeten av italienska samtida formgivare och arkitekter på New yorks Museum of Modern Art i maj 1972. curaterad av den unge i Argentina födde och på Princeton utbildade Emilio Ambasz presenterade Italy: the New Domestic Landscape1,några av de mest provokativa designföremålen och miljömässiga proto­ typerna som tagits fram i Europa under dessa år. Ambaszs syn på Italien ingick i en uttänkt strategi att inför den amerikanska publiken lansera en mer politiskt laddad och kritiskt komplex inställning till vad som fram till den tidpunkten hade varit en i stort sett rationellt genomförd industriprocess i syfte att gene­ rera produktdesign. Det italienska designfenomenet uppstod under en ovanligt stormig tid i den italienska samtidshistorien. Återuppbyggnaden av nationen, det snabbt växande välståndet och en allt större underprivilegierad befolkningsgrupp skapade stora sociala spänningar. Från mitten av sextiotalet till i början av åttiotalet upplevde landet genomgripande social oro, student­ och arbetar­ ockupationer och väpnade militanta aktioner, och detta pågick längre än i något annat europeiskt land inklusive Tyskland. Det var inte bara arkitekter och formgivare utan en hel generation som drogs mot radikala ytterligheter.